Awkward doesn't cover it. 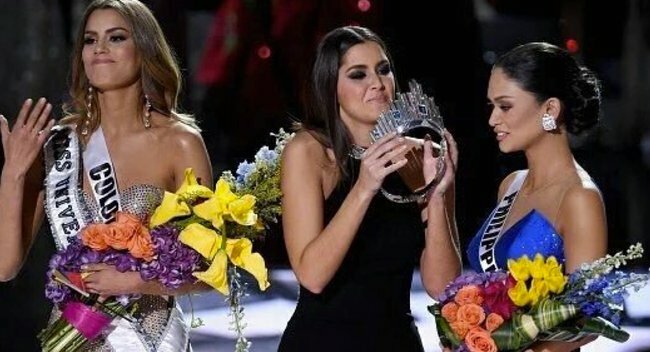 TV host accidentally crowns wrong Miss Universe. Ok, so what’s the worst thing that can happen in a beauty contest? You break a heel? Forget the answer to a question? Trip down the stairs? The worst thing that can happen is you have to give your crown back – less than a minute after winning. Host Steve Harvey made a massive blunder when he accidentally read out the wrong name at this year’s 2015 Miss Universe pageant in America. Harvey misread the announcement card, announcing Miss Colombia, Ariadna Gutierrez, as the winner. Ariadna had already made her inaugural strut down the catwalk as the 2015 Miss Universe when host Harvey realised his blunder. “Listen folks, let me just take control of this. This is exactly what’s on the card. I will take responsibility for this. It was my mistake. It was on the card. Horrible mistake… but I can show it to you right here. And, as to be expected, the trolls were onto the situation straight away, flooding Twitter with some hilarious reactions. Something tells us Steve Harvey won’t be forgetting this for a long, long time. Wait, haven’t we seen this happen before?